(February 12, 2014- Boston, MA): Democratic Candidate for Lt. Governor Mike Lake was officially endorsed by State Representative Frank Smizik of the Fifteenth Norfolk District this week. Supporting Lake, Smizik emphasized, "Mike understands the importance of the job, especially in keeping strong connections with local officials and getting their input in developing state policy." Smizik is the second elected-official from Brookline to officially support Lake, who was endorsed by former Massachusetts Governor and Democratic presidential nominee Michael Dukakis and his wife Kitty last December. Smizik—who serves as chairman of the House Committee on Global Warming and Climate Change—praised Lake's knowledge on the dangers fossil fuel emissions pose to our environment in addition to his commitment to creating more clean energy and developing policies aimed at addressing the threat of climate change. 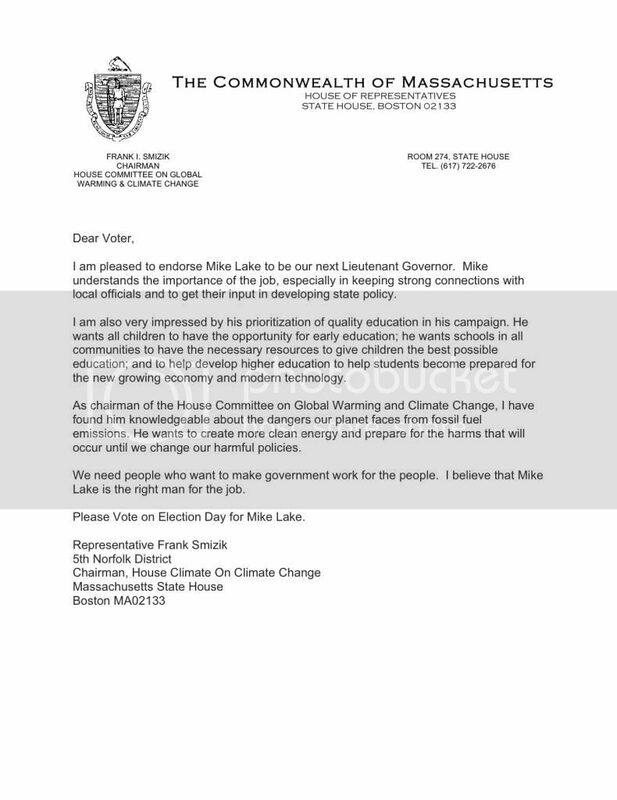 In his endorsement of Lake, Smizik applauded Lake's emphasis on the importance of creating high-quality education opportunities as a means of achieving social justice and economic empowerment for all Massachusetts residents. "He wants all children to have the opportunity for early education; he wants schools in all communities to have the necessary resources to give children the best possible education; and to help develop higher education to help students become prepared for the new growing economy," said Rep. Smizik. "We need people who want to make government work for the people. I believe that Mike Lake is the right man for the job." Lake was appointed by President Clinton as Special Assistant for White House Operations and is the President and CEO of Leading Cities, an international organization that focuses on exchanging solutions to municipal challenges and creating jobs through business development. More info on Lake and the campaign can be found at http://www.ElectMikeLake.com.